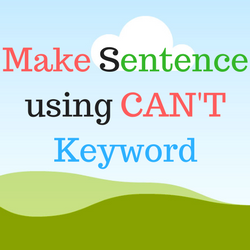 Make new sentences by only using the can’t keywords. To improve yourself by practicing it. it can help you grammatical and English writing and reading skills. make sure. Its negative word can ensure ownself by doing Can’t Keyword. I can’t live without my mother. I can’t make a sentence on this topic. I can, t believe your love. I can’t believe in you hope maybe? I can’t talk about if the meter. I can’t go with you but I’m so busy. I can’t imagine without you. I can’t think a single day without you. I can’t cheat on you. I can’t learn without search English group. I can’t quarrel with you. I can’t report to you. Azam Siddique can’t eat too much meat and sweet but also vegetable etc. I can’t go in this place without you. I can’t unlike your post. Men can’t succeed with industry. I can’t speak to you. I can’t speak English fluently. I can’t forget my friends. I can’t imagine me without you. l cannot jump on Calvert. l cannot love him again. I can’t believe that you are a lier. I cannot understand why you mistake again and again. I love you, my mother. I can’t forget you etc. I can’t leave my attitude. I can’t think without you. I can’t leave my mother because she is my life. I can’t leave my mother for the girlfriend. We cannot think a moment without a mobile phone. I can’t believe me. Because you are a very dangerous person. I can’t play without you. I can’t love him who can’t love me. I can’t understand. How am I well from sick? Please, everybody, pray for me. We can’t leave without love. Love is an essential part of our life. I can’t go to India. I can’t leave this group. I can’t give up you. I can’t accept you in my life because I don’t like to love you. I can’t do the work. I cannot do this work. I can’t speak English I can’t cook I can’t to do the math I can’t go home. I can’t leave holy Quran, Sorry I can’t. I can’t sleep without Coil pillow. I can’t deny the kindness of Almighty Allah. I can’t think my life without you. I can’t believe that English isn’t an international language. I can’t drive without your help. I can’t take you behave because you are so crazy. I can’t remind your name. I can’t joint to army job in my life. I can’t sing without you. I can’t post “S.E” group. I can’t live without my father. I can’t forget my first love, Lol. I can’t go without you. I can’t leave Search English group. I can’t hang out without you. I cannot read without my glasses. I can’t believe this! How fools you are!! I can’t forget you honing. I can’t eat without you. Without study hard, you can’t succeed in life. She is my wife and she is my life, without him, imagination cannot be done. Without him, any work cannot be successful. I cannot walk without him. I cannot practice English without him. I cannot any work without my bosom friend. I can’t live without hangout. I can’t comment without search English group. Now I can’t think English without search English. I can’t die for you. I can’t eat these apples without you. I can’t solve that problem without you. I can’t prepare for my CSS exams without any teacher. I can’t share anything from here without you. I can’t pass my exams without preparation. I can’t purchase this expensive vehicle without money. You can’t make it without me. You can’t find your friend in UAE without any help. We can’t answer these questions without your help. We can’t win this game without your support. We can’t go there without you. She can’t drink milk without sugar. She can’t take care of her children without her husband. I can’t fight with him without any reason. I can’t check the electric current without a tester. I can’t burn these papers without matchbox. I can’t play cricket without gloves. I can’t punish him without any reason. I can’t wait for you because I am already late. I can’t play tricks with my friends as you are playing. My brother can’t go without me. He can’t tell a lie with his parents because he loves them and doesn’t want to miss them. I can’t charge my mobile phone without electricity. I can’t press the keys of a mobile phone without fingers. I can’t read small words without my glasses. I can’t survive without giving comments in SE group. I can’t live in Dhaka city. I can’t know English so I can’t speak well in English. I Cannot sleep without vocabulary. I can’t do anything without you! I can’t attend my study. I can’t give him money. They can’t attend this party. We can’t buy a car because of our poorness. I can’t love her. I can’t leave her. I can’t believe that he can say this kind of lie. I can’t speak well in English. I can’t alone without you. I can’t hate you. You can’t kiss me. Man can’t leave without rest and recreation. I can’t believe live without you? I can’t go to college without GF. We can’t pass a day without electricity. We can’t live a second without oxygen. I can’t think a day without the help of science. I can not wake.I can not how to swim.I can not make bread. I can’t tall with you. I can’t speak properly in English. But I want to try more practices. I can’t forget my parents. I can’t work for you. I can’t go with you. I can’t think of what to do…?? I can’t love due to blackface. I can’t make a sentence. I can’t practice every day. I can’t proper guideline to you. I can’t marry you until you follow the Islamic rules. I can’t write without a pen. I can’t improve my English without search English group. I can’t meet my friend. I can’t sleep without eating. I can’t believe your talk!! I can’t want to talk with him. I Can’t Play Without My Brother. I can’t speak English like of you. Why I can’t control myself? I can’t without learning English. I can’t believe those people who always speak a lie. I can’t stay here without you. I can’t talk with you. I can’t speak English perfectly. I can’t go hear without you. I can’t go with you, so don’t request me. I can’t wait for my friends. I can’t give up my hope. I can’t rely on u.
I can’t walk in barefoot. I can’t sit for a long time. I can’t imagine how did u do that? I can’t laugh at you. I can’t live without you. I can’t read it. I can’t you love. I can’t wait for the news. I can’t think without you. I can’t love you because of your liar. I can’t talk to you. I can’t do this so won’t request me. I can’t speak in English. I can’t think without my parents. I can’t read this book. The miscreants cannot create any disturbance in the society if the Police and the conscious citizens work together to keep social law and order. I can’t work without you. I can’t help without you. l can’t tolerate fake people. I can’t believe my foe. I can’t alone without Sharmin. I can’t think something without quarrel. we can’t achieve our goals without industry. I can’t marry without you. she can’t speak English fluently. you can’t speak English fluently. I can’t do something illegal. English Spoken I don’t believe you. I can’t take anything normal. I can’t live without Family. I can’t kill you because of you lovely friend. I can’t cook China food. I can’t drive the car. I can’t go to varsity today. I can’t speak to you over the phone. I can’t do this. I can’t play with you. I can’t help you. I can’t obey you…I can’t live without you. I can’t accept you. I can’t forget you because you help me. l can’t say you my feelings. I can’t remember what happened. I can’t leave the group. I Can’t Go To Abrot. I can’t forgive the stupid who has misbehaved with me. I can’t Explain my feelings properly. I can’t accept your proposal. I can’t stay here. I can’t take drugs. I can’t tell a lie.He can’t go there. He can’t come here.I can’t teach you. I can’t live without my parents. I can’t find out my lover. I can’t love u because of your invisible in my mind. I can’t leave form SEG as my soul as especially my heat. I can’t forget my lovely helpful friends. I can’t speak English fluently. That’s why I always try my level best and staying in this group and practice more and more for learning English. I can’t do this work. I know you can’t move anywhere except me. We can’t do it right now. We can’t want to get it back. I can’t go there today. He can’t come here. She can’t make a post forgiving here. we can’t leave him this way. Without practicing we can’t increase our English skill. I can’t anything without my mum. He can’t think without me. I am sure you can’t it. I can’t forget you Miss Pori. I can’t live without my baby. I can’t go to market. I can’t use Facebook without search English. We can’t forget our past. I can’t miss u.i can’t go home with my friends. I can’t carry my bag. I can not forget you forever. I can not marry you. I cannot go university today. Man can’t live without water. I can’t die without you. I can’t see without my eyes. We Can’t Morden Life Without Science. Thanks for your nice and valuable post really outstanding post. I can’t eat rice. I can’t forget you. I can’t think you. I can’t forgive you. I can’t do anything without an idea! I can’t live without learning English. I can’t live a long time without learning English group. I cannot forget my past. I can’t want your help. I can’t forget search English group. I Can’t Drink Coffee without You. I can’t cheat on my parents. I can’t hurt my parents. I Can’t Forget This Fact. I can’t know the fat. I can’t live without my parent. I can’t live basic demand. I cannot live without my mother. I cannot live without my friends. I can’t believe you anymore. I can’t sacrifice my life for you. I can’t live without eating? I can’t leave this place without his permission. I can’t live without my heart. I can’t leave my home. I can’t leave without my family members. I can’t laugh any reason. I can’t work at any time. I can’t spend my valuable time with you. I can’t eat any kinds of food. I can’t care any person. I can’t reply any question. I can’t without my parent’s because I love my parents… I always pray for my parents. Every time they are very happy. I can’t learn English. I can’t eat rice. I can’t believe you. I can’t agree with you. I can’t believe my brother. I can’t live you, I can’t find you, I can’t love you, and I can’t make you. I can’t live without drink water. I can’t live without eating food. You can’t go to my home today. I can’t support your post. I can’t forget you. Because you are a great looking person I have ever seen. I can’t ever forget you. I cannot sleep without a wife. I can’t write a comment on your post. I can’t live without you. I can’t live without you. I can’t believe you. I can’t feel without you. I can’t pass my time without practice with search English group. Man can’t live alone. Man can’t live without music. I can’t live without you. I can’t smile at you. I can’t forget it. We can’t love dirty cloth. Last night we can’t sleep for big bit busy. I can’t believe love you. I can’t go there without your permission. I cannot live without u.
I can’t learn English without SEG. I can’t live my mother and family. I can’t finish the work. I can’t believe you what you say. I can’t do any bad work. I can’t succeed without you. I can’t smoke because that is a bad habit. I can’t live without mobile. I can’t sleep at afternoon. I can’t say what I say you. I can’t tolerate your ego. I can’t decide what I should do now. I can’t live without my book. I can’t depend on any person for the success of my life. Why do we think, we can’t? If we try harder, there will be nothing that we can’t do. I can’t give proper time to Search English. I can’t speak English frequently. I can’t suffer your pain. I cannot marry without you. I can’t trust anybody without my family members. I cannot believe any one person? I can’t imagine my life without my mother. I can’t live without our family. I can’t live without Ma. I can’t love you Puja. Man can’t forget his/her1st relationship. I can’t finish the hard work alone. I can’t visit alone. I can’t live without my dear mom and dad! They cannot do hard work so they are very weak. He cannot go under the sun because he has been migraine pain. I can’t forget you Allah and Muhammad (Sallallahu Alayhi Wa Sallam). I can’t feel better without you. I can’t buy a car. I can not believe the boy. I can’t do walk 2 hours. He Can’t buy a by-cycle let alone a motorcycle. I can’t love anyone without you – I can’t hate you. I can’t depend on you. We can’t fly in the sky. I can’t lot enough time give this group. I can’t stay without search English group. I can’t talk without you. I can’t do any comment stay this group. I can’t live without someone special. I cannot talk in English. I can’t sing any son. I can’t ever give up. I can’t believe liar person. I can’t forget my best friend because he/she mixes with my heart. I can’t your friend because you are not my type and quality. I Can’t-Do This Crime. We Can’t Dishonor Our Parents. You Can’t Cheat On Me. He Can’t-Do This Mistake. I Can’t Speak English Fluently. You Can’t Misbehave With Her. I can’t realize rural reality. Bonna I can’t live without you. I can’t think anything without u. We can’t forget our painful past. I can’t remember you because I was forgotten about myself that who I’m. I can’t tolerate you. I can’t call her. I can’t mention her here. I can’t forget my uncle because he is only one person who always tries to happy me. I can’t stay without chatting with Abu. I can’t forget Abu at all. I can’t know how to use FB. I can’t meet with you. I can’t forget my country in Bangladesh. I can’t complete the sentence. I can’t take everything easy. I feel the complexity. I can’t forget my children live. I can’t leave to you. I can’t misbehave with others. I can’t learn properly without practice. You can’t do this without me. I can’t believe the unknown person. I can’t travel boat alone. What if I can’t make a sentence? I can’t hate you. I can’t stay with you. You can’t go there. you can’t say this. I can’t speak English properly. I Can’t Meet With Him. Can’t I do the work? I can’t go market, I can’t live alone, I can’t speak bangle, I can’t write a letter, I can’t without my Parents. I can’t think of you. I Can’t Feel Happy Without You. I can’t make a sentence by can’t. I can’t bear you anymore. I can’t take it anymore. I can’t do this. I can’t help u.
I can’t leave my mobile anywhere. I can’t wait until you come. I can’t help him this matter. I can’t play this match. They can’t do the work. I can’t good to speak English. I can’t enough practice my speaking English. I can’t cope wide him! I can’t hug you. because of you far from me. We can’t happy without father and mother. I can’t speak English properly. You can’t come back in the world after death. We can’t discover anything without Allah’s help. I can’t love again without a future wife. I can’t forget Allah. I can’t forget you ever. I can’t live without water. I can’t explain how much I love you! I can’t trust you so easily. I can’t read the book. I can’t give this gift without him. I can’t believe you at work. I can’t believe you talk. I can’t eat with you. I can’t change the life with you. I can’t drive the care. I can’t write the love letter. I can’t go to college because I am ill. I can’t think my life without my dear ma. I can’t know what are you do now. I can’ eat rice without fish or beef. I can’t learn English without in search English group. I can’t give you this book. I can’t trust you without any proof. I can’t share anything because you aren’t my close friend. I can’t wait for you cause always you come late. l can’t take the decision without my parents. I can’t know that what are you feeling now?